Absolutely stunning this Pure Illusion carpet 100% handmade with pure New Zealand wool.It has a unique design. This carpet is a “One of a kind”. We can make it any size according to your choice. - This stunning handmade knotted carpet in 100% New Zealand wool and handcrafted by talented craftsmen. - It has a very intricate pattern. This design shows trees without leaves in vertical style. - Design in vertical is a main focal point. This is an absolutely very intricate pattern. - The main colors are Blue, Black, and Ivory. The ground in ivory color. This is suitable for the modern home interior. - It has taken around 6 months to weave this unique pattern. 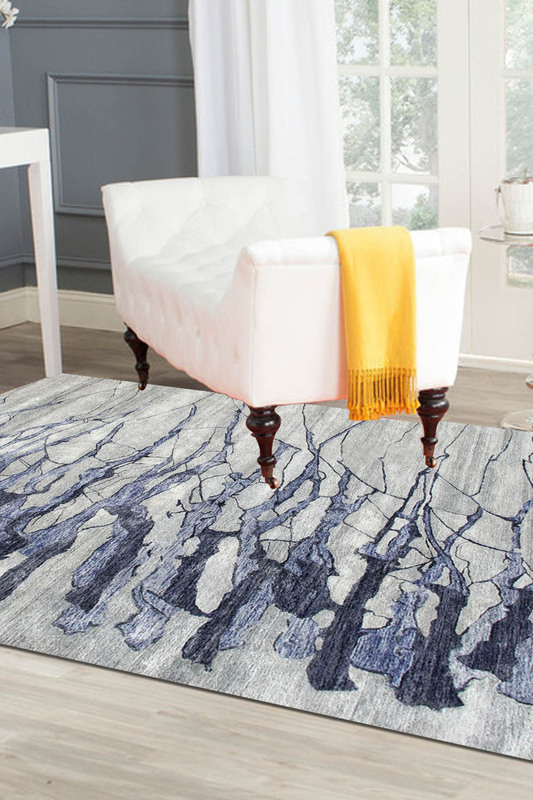 All of our hand-knotted rugs are professionally washed and are individually inspected before leaving our warehouse. We shall intimate you once your customized rug has been exclusively hand-woven for you and this includes FREE shipping worldwide. There might be a slight variation in color between the actual product and your screen due to a difference in computer monitors. We try our best to display the most accurate images. Please be advised that lengths and widths may slightly vary from published dimensions although we strive to provide the most accurate measurements possible.